The arch is more than 6 feet tall, 4 feet wide and 2 feet deep and covered with beautiful cottage garden roses in ivory and white. The swing is suspended on steel wires and will support cakes weighing upto 25kg, that is a lot of cake. The display can be customised with fairy lights or strings of crystals wrapped around the wires. Another option is to have tea lights suspended from the top of the arch, more flowers or osrtich feathers. 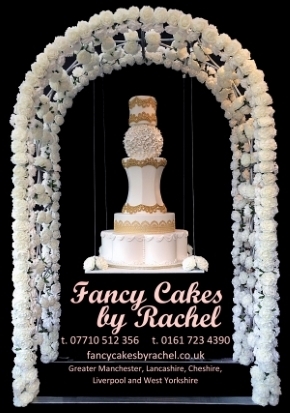 The photgraph of the swing cake display does not capture the how amazing this looks, it will be the focal point of any wedding and will amaze your guests. If you would like this display for your wedding cake you need to book early as we anticipate this being very popular and will be booked up quickly.